The Los Angeles Lakers are working on a trade to acquire center Roy Hibbert from the Indiana Pacers, reports ESPN’s Marc Stein and Ramona Shelburne. The parameters of the trade haven’t been finalized, but the Lakers will likely absorb Hibbert into their cap space while sending draft picks in return. This is a fairly reasonable gamble for Los Angeles. Hibbert is still one of the best rim protectors in the league. Teams not only shoot poorly at the rim when Hibbert is in the game, often times they avoid the paint altogether. However, what Hibbert gives on the defensive end, he takes away on the offensive side of the ball. Outside of pounding a small Heat team in the playoffs, Hibbert has never shown himself to be a consistent offensive threat. It’s hard to imagine Hibbert running up and down and keeping pace with some of the fast teams in the West. Will he have a place on the court against the likes of San Antonio, Houston and Golden State? That being said, his contract expires after this upcoming season, so L.A. is wise to soak up his defense for a year before trying their hand at free agency again in 2016. 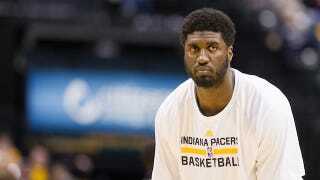 The Pacers have been trying to get rid of Hibbert for some time. Larry Bird practically begged him to opt out of the last year of his deal, citing Indiana’s preference to play a new style of basketball. It’s an interesting time of transition for the Pacers. Their identity as a smashmouth, play-two-traditional-bigs team is over. The longtime starting frontcourt of Hibbert and Daivd West is no longer, with West also leaving the team this summer. And now Paul George will team up with Monta Ellis on the wing. Frank Vogel proved himself to be a hell of a coach last season, when he guided a mostly George-less squad into playoff contention for most of the year. But the roster that made LeBron James sweat in the playoffs year after year is no longer, and it may be a while before Indiana approaches that level of play again. It’s another offseason where Los Angeles will leave mostly empty handed. They were spurned by LaMarcus Aldridge, and as of now don’t seem to be in serious talks to nab Boogie Cousins or another big star. It’s very easy to pile on the Lakers right now for seemingly scaring away every talented player with silly presentations, but next summer, with Kobe’s deal off the books, it could take just one or two signings to make Los Angeles a threat in the West once again.